This page is designed to look at the general background of mobilisations, the effects, mechanisms and contraindications. We have only selected one movement of the lumbar spine to focus on in terms of specific techniques, however the theories behind the techniques can be transferred to most other techniques. This page needs to have content added which looks at other specific techniques of the lumbar spine other than mobilisations to improve flexion. Additionally content should be added to encompass the other techniques included under the umbrella term of 'Manual Therapy'. In principle, any of the structures within the lumbar spine that receive innervation from the nervous system can be a source of back pain. Thus back pain can arise from any of the ligaments, muscles, fascia, joints or discs of the Lumbar Spine. Definition: Mobilisations primarily consist of passive movements which can be classified as physiological or accessory . The purpose is to provide short term pain relief and to restore pain-free, functional movements by achieving full range at the joint . Joint mobilisation is a treatment technique which can be used to manage musculoskeletal dysfunction , by restoring the motion in the respective joint . The techniques are performed by physiotherapists, and fall under the category of manual therapy. Spinal mobilisation is described in terms of improving mobility in areas of the spine that are restricted . Such restriction may be found in joints, connective tissues or muscles. By removing the restriction by mobilisation the source of pain is reduced and the patient experiences symptomatic relief. This results in gentle mobilisations being used for pain relief while more forceful, deeper mobilisations are effective for decreasing joint stiffness. . This section focuses on the effects and mechanisms of mobilisations, as found in current literature, and on the effect of mobilisations through specific methods for those suffering from stiffness or pain. Research has shown that mobilisation used as a therapy can produce significant mechanical and neurophysiological effects    . The explanations of these effects - the mechanism of mobilisation - is still relatively unknown, especially in regards to the spine, and is subject to further research . However, several theories have been established in accordance with effects seen, including the effects of pain relief, increasing range of motion and the influence on the autonomic nervous system. Pain gating refers to the theory that simulation of the mechano-receptive peripheral afferent nerves in the muscles produce sensory input that interferes with nocioceptive impulses at the spinal cord . The input from the larger sensory nerves inhibits the transmission of pain through the smaller nocioceptive nerves to the brain, leading to a pain reliving result . Therefore, the processes of stimulating mechanoreceptors via mobilisation produces short term pain relief through the mechanism of pain gating . However, the pain gate theory only explains the pain relieving effect during the mobilisation, not any long term effects post treatment. Therefore it is hypothesised that any longer term pain reliving effects are mediated by higher brain mechanisms  - summarised below. Research has shown that mobilisation leads to activation of pain inhibitory pathways that originate in the midbrain and travel down the spinal cord - the descending pathways   . The pathway stimulation works to provide pain relief by suppression of pain through this inhibitory mechanism. In addition to this these descending pathways, research has shown a trend where regions of the brain responsible for central pain processing are suppressed during mobilisation . It has been hypothesised that mobilisation promotes adaptations of the nervous system  with a decrease in the level of neural input from the painful site. Research also suggests that mobilisations increase the pain threshold levels - relative hypoalgesia . It has been suggested that this could be due to electrochemical changes in the regulation of threshold potential . Mobilisations are often used with the objective to increase the range of motion of the joint through stretching of fibrous tissue . This stretching may cause the tissue to 'creep'. The phenomenon of creep relates to the ability of tissues to change shape over time as a constant load is applied .The creep deformation is not permanent and, once the load is removed, the tissue will slowly resume its original length . However, in the short term, this mechanical effect of mobilisation enables an increase in range of motion at the joint. Mobilisation has been found to influence sympathetic activity, affecting heart rate, blood pressure  and respiratory rate . These sympathetic responses could possibly be linked to another evidenced effect of mobilisation - changes in blood component levels. Teodorczyk-Injeyan et al (2006) found that mobilisation effected the levels of blood components, with a reduction in inflammatory proteins. Therefore it was suggested that mobilisation could be a potential therapeutic modality to reduce inflammatory response - working as an anti-inflammatory mechanism, though the exact explanation for this process is unknown . Bialosky et al (2009) suggested that the mechanical and neurophysiological effects explored here are interlinked. They proposed that a mechanical force initiates a chain of neurological responses, which would then produce the outcomes associated with manual therapy. This proposal was illustrated in their model of the mechanisms of manual therapy. The effects of mobilisation and the mechanisms responsible are not fully understood and more research is needed to provide evidence for the theories discussed. It is also important to note that variables such as the placebo effect and psychological factors may also pertain to the effects seen . Mobilisations involving pressure onto the vertebra, can be used to increase joint range of motion, and also to produce and analgesic effect. First, assess the patients movment using physiological movements, select the movement that has limited ROM and needs to be stretched. Then accessory movements can be used. Pressure applied through the thumb or pisiform against the vertebrae in the direction of the movement that is stiff. Staccato techniques are used to move a stiff joint through its maximum range before the bordering joints have time to start moving aswell . If there are no symptoms from the joint, then the speed of the staccato can be quicker, however, if symptoms are moderate, then the movements need to be more fluid. The joint being treated should be positioned in a symptom free way. To decide between accessory movements and physiological movements, the one, which can be performed with the larges amplitude of movement, most comfortably for the patient, is used. If a joint is painful, oscillations in mobilisations should be smoothly and even, so that changes between the on and off pressure cannot be detected. Pressure is applied through the thumb or pisiform to produce large amplitude of movement, with very little pressure and without any degree of stiffness felt. Any movements should be in the painless direction, in a large, slow, smooth manner, stopping before the onset of any discomfort. As the patient’s symptoms and ROM improve, the technique can be taken into a known and controlled degree of discomfort. Patients with rheumatoid arthritis and osteoporosis are contraindications to forceful mobilizations. This section will focus on mobilisations to increase lumbar flexion. Passive Physiological Intervertebral Movements (PPIVMs) are most often used in an assessment capacity rather than as a treatment therapy. PPIVMs are used to determine a range of properties of spinal movement that will guide the use of manual therapy techniques . PPIVMs test the movement available at the spinal level identified by application of a passive physiological motion  and palpating between adjacent spinous process or articular facets . While the therapist passively moves the spine they can note the range of motion, any muscle spasm or provocation of pain . They can confirm any restriction of motion seen in active movement and can also identify hypermobility . Additionally the spine can be taken to the end of range and there the therapist can apply over pressure to assess the end-feel of the movement . In this way PPIVMs can help the therapist to identify location, nature, severity and irritability of symptoms. Research has shown that PPIVMs have a good intra-tester reliability . However, the inter-tester reliability has often been questioned and some research has reported it to be poor  . Research has shown that PIVMs testing in flexion has high specificity (99%) but low sensitivity (5%) . - The patient lies on their side with hips and knees flexed . The therapists positions themselves in front of the patient. - The therapist reaches under the patients knees, lifting them up and resting the patients lower legs against the therapists upper thighs. - Leaning over the patient the therapist places one arm over the patients scapular to prevent backward rotation of thorax. - To produce passive flexion the therapist rocks from side to side with their pelvis, carrying the patients legs along with them. - Opening and closing of the interspinous gaps can be felt as the patient is passively flexed. From this position passive extension can also be assessed. When palpating/assessing the lower lumbar spine the movement will need to be performed in relatively more flexion when when assessing the upper lumbar spine movement . A Passive accessory intervertebral movement (PAIVM) is a mobilisation technique that produces movement of a mobile vertebral segment without active participation of muscles related to the movement. This section will focus on the application of Posterioanterior (PA) mobilisations of the lumbar spine which is achieved by applying a force on to a vertebral segment in a posterioanterior direction (Back to front). PA mobilisations are a commonly used manual therapy technique that has shown to be effective at reducing pain in patients with low back pain (LBP) . So far, evidence suggests immediate pain relief following treatment, and also some evidence suggests an increased range of movement (ROM) of lumbar extention   . However, literature is still variable on the overall effects of ROM and pain. During flexion, the superior vertebral body and its inferior facet joints move relatively anteriorly and superiorly on the inferior vertebral body and its superior facet joints. Therefore, to aid flexion the mobilisation needs to be applied to the vertebra above the stiff/painful vertebra to facilitate the anterior-superior translation of the facet joints. Therapist stands to side of patient placing their pisiform/ulnar surface of hand over the selected spinous process (SP) with their wrist in full extention. Other hand placed ontop of hand to reinforce. (See Fig. 3). Therapist's shoulders should be directly above the SP with elbows slightly bent. Therapist uses their body weight to apply a PA force to the selected SP by leaning their body over their arms and performing rocking movements to provide oscillatory movements of the vertebra. On initial assessment and treatment, if the patient has very limited movement, a pillow can be placed underneath their abdomen, or the head end of plinth can be raised to position the Lumbar spine in relative extension. Similarly, if the patient cannot tollerate pressure directly through the spinous process, the therapist can apply pressure either side of the SP with either thumb on the transverse processes (bilateral PA). Definition: It is a manual therapy technique which was developed by Brian Mulligan, for the treatment of musculoskeletal dysfunction . It involves performing a sustained force (accessory glide) while a previously painful (problematic) movement is performed. Usually, the technique is indicated if, during its application the technique enables the impaired joint to move more freely without pain or impediment. Mulligan does not prescribe grades of movement or oscillatory movements. He prescribes taking the joint through its full range of movement and this entails taking it into resistance. When performing MWMs, the direction of the applied force is typically perpendicular to the plane of movement or impaired action and in some instances it is parallel to the treatment plane . Patient in side lying facing therapist. The patient's knees should be bent towards their chest in mid lumbar flexion and rested on the therapists hips. Therapist places forearms along the patients back to palpate between adjacent spinous processes. To isolate flexion, the problematic level is palpated and when passively moving the spine into flexion a sustained PA force is applied to the spinous process throughout the movement of flexion and then released. N.B *Correct plinth height is essential for this technique. ** It may take multiple attempts of the MWMs to find the correct level of the lumbar spine to decrease pain and/or stiffness. Patient in standing perpendicular to therapist. Therapist's need to stabilise pelvis via placing cup of hand other the ASIS. Therapist to palpate between adjacent spinous processes. The patient actively flexes lumbar spine and then extends to return to the neurtal position. To isolate flexion, again, the problematic level is palpated and when the patient actively moves into flexion, a sustained PA force is applied to the spinous process throughout the movement. Patient in sitting, facing away from therapist. The pelvis is stabilised via a belt being placed around the patients ASIS's and around the therapist's ischeal tuberosity. The patient actively flexes the lumbar spine and extends to a neutral position. The therapist maitains the tension on the belt throughout all movement. The problematic level is palpated and when the patient actively moves into flexion, a sustained PA force is applied throughout the whole movement of flexion to the spinous process. Moreover, it is generally agreed that the oscilliation depth and amplitude of movement is dependent on the patients symptoms. If the patient's main symptom is pain then oscillation depth should remain shallow (<55%) and should be maintained within a pain free range (e.g. Grade I and II). However, if the patient's main complaint is of stiffness then the depth of oscillation can progress to end of range providing pain is tolerable (e.g. Grade III and IIII). Refer to section 2 for maitland scale. ↑ Porter, S., (2005). Dictionary of Physiotherapy. London. Elsevier. ↑ Maitland, G., Hengeveld. E., Banks, K. and English, K., (2005). Maitland's Vertebral Manipulation. 7th Edition. London. Elsevier. ↑ Hertling D., and Kessler, R., (1996) Management of Common Musculoskeletal Disorders. Baltimore: Lippincott, Williams & Wilkins. ↑ Randall, T., Portney, L., and Harris, BA., (1992). Effects of Joint Mobilization on Joint Stiffness and Active Motion of the Metacarpal-Phalangeal Joint. Journal of Orthopaedic & Sports Physical Therapy. Vol 16, (1) 30-36. ↑ Korr, IM., (1977). The neurobiologic mechanisms in manipulative therapy. New York, Plenum Press. ↑ Maitland, GD., (1986). Vertebral manipulation. 5th edition. Sydney, Butterworths. ↑ Bialosky, J., Bishop, M., Price, D., Robinson, M., and George, S., (2009). The mechanisms of manual therapy in the treatment of musculoskeletal pain: A comprehensive model. Manual Therapy, Vol 14, 531-538. ↑ Zusman, M., (2011). Mechanism of mobilization. Physical Therapy Reviews, Vol 16, (4) 233-236. ↑ Pickar, JG., and Wheeler, JD., (2001). Response of muscle proprioceptors to spinal manipulative like loads in the anesthetized cat. Journal of Manipulative and Physiological Therapeutics, Vol 24, 2–11. ↑ BJA., (2002). Editorial I - Gate Control Theory of pain stands the test of time. British Journal of Anaesthesia, Vol 88 (6) 755-757. ↑ Zusman, M., (2011). Mechanism of mobilization. Physical Therapy Reviews, Vol 16 (4) 233-236. ↑ Grayson, J., Barton, T., Cabot, P., and Souvlis, T., (2012), Spinal manual therapy produces rapid onset analgesia in a rodent model. Manual Therapy, Vol 17, 292-297. ↑ Refshauge, K., and Gass, E., (2004). Musculoskeletal Physiotherapy: clinical science and evidence-based practice. 2nd Edition. Oxford. Butterworth Heinemann. ↑ Threlkeld, A., (1992). The Effects of Manual Therapy on Connective Tissue. Physical Therapy, Vol 72 (12) 893-902. ↑ Ernst, E., (2000). Does spinal manipulation have specific treatment effects? Family Practice, Vol 17, 554–556. ↑ 31.0 31.1 31.2 Maitland, G.D., Hengeveld. E., Banks, K. and English, K.eds., 2005,Vertebral Manipulation, Edition 7, London, Butterworth Heinsmann. ↑ 33.0 33.1 33.2 Maitland, G.D., Hengeveld. E., Banks, K. and English, K.eds., 2005,Vertebral Manipulation, Edition 7, London, Butterworth Heinsmann. ↑ Maitland, G.D., Hengeveld. E., Banks, K. and English, K.eds., 2005,Vertebral Manipulation, Edition 7, London, Butterworth Heinsmann. ↑ Magee, D., Zachazewski, J., Quillen, W., (2008). Pathology and Intervention in Musculoskeletal Rehabilitation. Missouri. Elsevier. ↑ Binkley, J., Stratford, P., and Gill, C., (1995). Interrater Reliability of Lumbar Accessory Motion Mobility Testing. Physical Therapy, Vol 75 (9) 786-795. ↑ Hertling, D., and Kessler, R., (2006). Management Of Common Musculoskeletal Disorders: Physical Therapy Principles And Methods. 4th edition. Philadelphia. Lippincott Williams & Wilkins. ↑ Porter, S., and Tidy, N., 2008. Tidy's Physiotherapy. 14th Edition. London. Elsevier. ↑ Phillips, D., Twomey, L., (1996). A comparison of manual diagnosis with a diagnosis established by a uni-level lumbar spinal block procedure. Manual therapy, Vol 2, 82-87. ↑ Abbott, J., (2007). 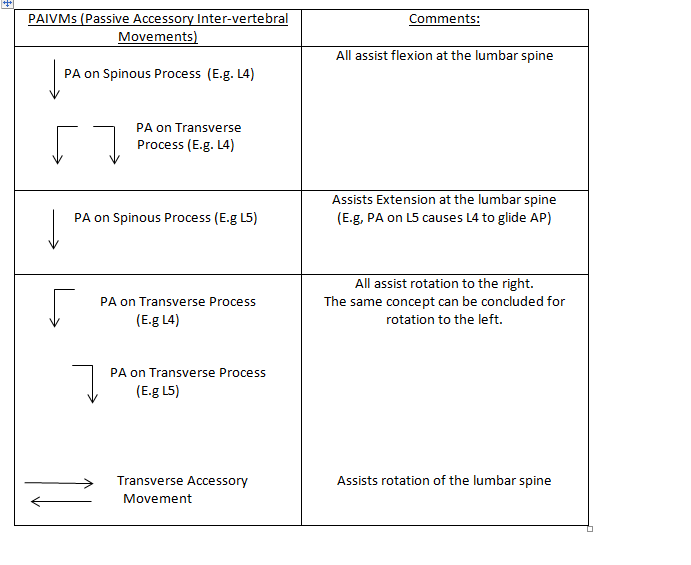 Passive intervertebral motion tests for diagnosis of lumbar segmental instability. Australian Journal of Physiotherapy, Vol 53, 66. ↑ McCollam, R.L. Cindy, B.J., 1993, 'Effects of Postero-anterior Mobilization on lumbar extension and flexion', Journal of Manual & Manipulative Therapy, vol 1, No.4. ↑ Powers, C.M., Beneck, G.J., Hulig, K., Landel, R.F. and Fredericson, M., 2008, 'Effects of a single session of posterior-to-anterior spinal mobilization and press-up exercise on pain and response with lumbar spine extension in people with nonspecific low back pain', Journal of the American Physical Therapy Association, Vol.88, Pp.485-493. ↑ Jonas. (2005). Mosby's Dictionary of Complementary and Alternative Medicine, Elsevier.. Available: http://medical-dictionary.thefreedictionary.com/mobilization+with+movement. Last accessed 11th Jan 2013. ↑ Vicenzino. (2009). Mulligans: Mobilisations with movement. Available: http://www.bmulligan.com/conference/downloads/vicenzino_keynote1_MUllConf09.pdf. Last accessed 11th Jan 2013. ↑ Mulligan B. Mobilisation with movement (MWM’s). Journal offckLRManual and Manipulative Therapy 1993;1:154–6. ↑ Mulligan B. (1992). Extremity joint mobilisations combined with movements. New Zealand Journal of Physiotherapy, 20:28–9. ↑ Mulligan B. (1996). Mobilisations with movement (MWM’S) for the hip jointfckLRto restore internal rotation and flexion. Journal of Manual and Manipulative Therapy, 4:35–6. ↑ Stephens G. Lateral epicondylitis. Journal of Manual and ManioulativefckLRTherapy 1995;3:50–8. ↑ Vicenzino B, Wright A. Effects of a novel manipulative physiotherapyfckLRtechnique on tennis elbow: a single case study. Manual TherapyfckLR1995;1(1):30–5. ↑ Hetherington B. Lateral ligament strains of the ankle: do they exist?fckLRManual Therapy 1996;1(5):274–5. ↑ O’Brien T, Vicenzino B. A study of the effects of Mulligan’sfckLRmobilization with movement treatment of lateral ankle pain usingfckLRa case study design. Manual Therapy 1998;3(2):78–84. ↑ Miller J. Case study: Mulligan concept management of ‘‘tennis elbow’’.fckLROrthopaedic Division Review 2000;3:45–7. ↑ Exelby L. The locked lumbar facet joint: intervention using mobilizationsfckLRwith movement. Manual Therapy 2001;6(2):116–21. ↑ Folk B. Traumatic thumb injury management using mobilization withfckLRmovement. Manual Therapy 2001;6(3):178–82. ↑ Mulligan. (1995). Spinal Mobilisations with Leg Movement (Further Mobilisations with Movement). Journal of Manipulative Therapy. 3 (1), pg25-7. ↑ Goodsell, M., Lee, M and Latimer, J., 2000, "Short-Term Effects of Lumbar Posteroanterior Mobilization in Individuals With Low-Back Pain",Journal of Manipulative and Physiological Theraputics, Vol. 23, No. 5. ↑ N.I.C.E guidelines, 2009, Low back pain: Early management of persistent non-specific low back pain, National Institute for Health and Clinical Excellence, Manchester.